Decision Makers use visualization tools to help them answer the question of WHERE (map and GPS), and also the question of WHEN (calendar and clock). They use a priority matrix to help them answer the question of WHICH, and social networking software to help them answer the question of WHO. But there are few tools that we all use to help us answer the question of WHY. In a chess game, instead of just knowing who won, a chess audience wants to see the first move, which leads to another set of options and then to the next decision, and so on. Prior decisions have a consequential impact on the possible options for the next decision. Without the context of prior decisions, we can’t follow the thought process, whether playing chess or running a business. Studies have shown that critical thinking test scores increase when using software with boxes and arrows that help us keep track of prior decisions. While there are several specialty applications available to visualize "tree" diagrams of options and choices, I prefer using a simple outline which shows just the chosen "branches." Anyone can be taught to make an outline, and no special software is needed. I call this design an Option Outline because it uses the structure of an outline, but shows the thought process of the options considered at each step. The way to “read” an Option Outline is to start at the top and read towards the bottom. For each indentation, the last option listed is the one that was chosen. Note that all of the choices need to be correct to lead to a correct solution. So, during a debate, you can discredit the final solution by attacking any of the choices. So, in the above Option Outline, we see the options considered, the choices made, and the progression of the thought process based on those choices. In this case, the basis was that humans need to make complex decisions, and the final choice for a solution was that we should use Option Outlines to help us do just that. In the above example, we can see how a link to a decision matrix helped answer the question of WHICH, but is just one step in the overall thought process of WHY. Using an Option Outline helps us keep track of our own thought process, and provides transparency into the decision making process for others. An executive remarked “I used a calendar, watch, map, and GPS to get to a meeting where we sat around and discussed WHY. Now I can show them my Option Outline.” Lessons Learned from each project can now be captured in a format that allows us to leverage the thinking from one project into another. This is how true learning organizations turn lesson learnings into actual lessons learned. Using the topic of climate change, given it is well known and sufficiently complex, we can follow the thinking of how a bill becomes a law, with an Option Outline. The purpose here is not to debate the solution of cap and trade, but to show how an Option Outline can help untangle a compressed thought process, to keep our own thinking straight and provide transparency for others. 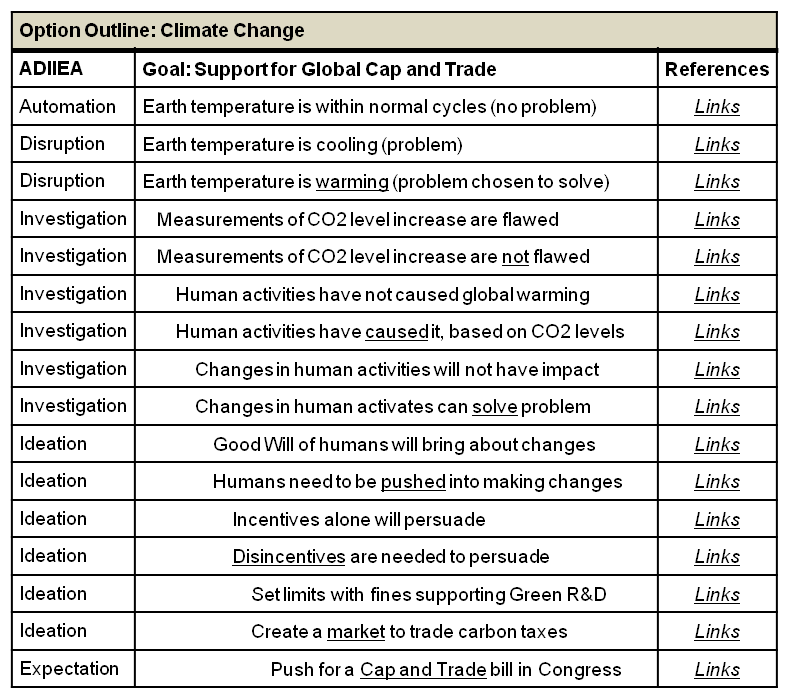 If you support cap and trade, then you could create the links to the supporting data and reasons for choosing the options that created the thought process. You could probably list additional options that were considered. And if you are not for cap and trade, then you can create the links to the supporting data for the options that were not chosen. Note that when opinion polls are taken on any of these options by themselves, they are essentially taken out of context from the overall thought process. Some people may be labeled as “global warming skeptics” when really they are skeptics of “man-made” global warming, or just skeptics of cap and trade as the best solution. An Option Outline lets us see exactly where within a thought process an agreement breaks down. In general, wherever we find disagreement of opinions, an Option Outline can be used for conflict resolution purposes to find where there is agreement and where that agreement breaks down. In the Information Age, we have access to data and final decisions, but the explanations are buried within the documents, if captured at all. In the Explanation Age this will be turned around: Explanations become the focus of the user interface, using an Option Outline, with reference links to supporting data and reasons for each choice within the options. Transparency International is an organization that tracks corruption and transparency measurements for each country around the globe. They have found that the governments with little transparency are associated with the countries that have higher poverty rates. Transparency is an indicator of how well the citizens will live. So, with business, and the “people’s business,” we are asking for more transparency—not just into the data or decisions, but into the thought process behind the decision points of an explanation. The majority of the world’s countries are now democratic. And with this dispersion of authority comes the responsibility of the citizens to discuss the ideas that govern their future. For corporate business, and the people’s business, imagine transparency measured by how clearly the thought process is presented, rather than how many pages or documents are posted online. Imagine the processes that govern our institutions actually aligning with a sense-making process, instead of just a box-checking process. This is the Explanation Age. "In December of 2009, Wired published a powerful example of not having ready access to the thought process of previous projects. An engineer was recently thumbing through a book published in 1958 to learn more about the beginnings of atomic energy. Of course, we have all heard of Plutonium and Uranium for the role they play in nuclear weapons and nuclear energy. But buried inside this old book were the notes on another possible solution that was tested but discarded, called Thorium. Atomic research essentially began as a military project, and Thorium was just not the best choice for making a weapon—although its side effects are less risky. Now some believe it is the perfect material for safer nuclear power plants. The purpose here is not to debate the final viability that Thorium may play for nuclear energy, but to argue that an Option Outline could have been created for the project that listed Thorium as an option not chosen, with links to supporting material which future research could have built upon more quickly."